I was in a predicament, one that wasn’t uncommon for me. I had come up with a great idea, but set my plans in motion too late. My in-laws were celebrating their 50th wedding anniversary and planned a small gathering of immediate family to celebrate it. 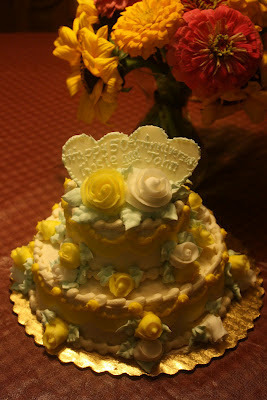 I wanted to surprise them with a cake -- something pretty and tiered and wedding-ish. I went into my local bakery on a Friday -- the celebration was on Saturday -- and was told that I didn't give them enough turn-around time to make such a cake. My only hope: Wegmans. I went to the bakery at the Penfield Wegmans and started telling the girl behind the counter my situation. "Do you need an anniversary cake?" she interrupted (the bakery was busy). "Yes, but it's my in-law's 50th, so I wanted something nicer than a sheet cake," I stammered. "We can do a tiered ultimate," she said. I told her that the group was just nine people, and she said that she could do a small one for $17. She could have it ready by the next day, so I went with it. She asked me their names and marked the sheet with "Happy 50th Anniversary Rosie and John.” I couldn't imagine how all of that would look on a tiered cake, but went with that, too. I left the store with low expectations, kicking myself for not ordering the cake sooner. I picked up the cake the next day, and was utterly amazed at my $17 cake. It was adorned with roses and rosebuds like a miniature wedding cake. The words were not written on the cake, but on a white chocolate heart set in the top like wedding cake topper. My in-laws were delighted with their cake, and even better, it was delicious. It was moist and not sicky sweet like most grocery store vanilla cakes. It was heavy on the icing, but that's what happens when you add on all those flowers. Whew! I love it when a plan -- even a last-minute one -- comes together. This post also appears on my blog for Flavors of Rochester.